Diesel Cafe – located in Somerville, MA's trendy Davis Square – became a member of the Toast family in 2015. While technically a cafe, full of house-made bakery treats, sandwiches, and organic, locally sourced coffee, the way co-owners Jennifer Park and Tucker Lewis run the space, Diesel is more of a hub for Somerville’s niche community of artists, writers, college students, activists, and suburban families. As their website reads, Diesel was opened as a place "where we would drink coffee all day long, work with people we loved, respect the people with whom we worked and hopefully create a strong community along the way." This spirit of respect, appreciation, hospitality, and community is integral to Diesel's approach to restaurant operations. Now entering into what will be their 20th year, Diesel continues to actively build spaces inside their old-timey, garage-themed walls to bridge connections within their local community. As we near the end of yet another year and the spirit of thanks and appreciation is in the air, your restaurant may be looking for ways to give back to your local community. 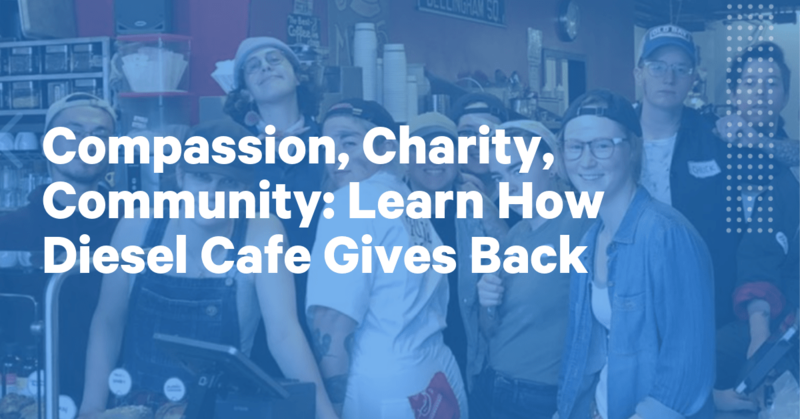 Here are a few of the many ways Diesel Cafe gives back to the Somerville community, as well as ideas for your restaurant to follow suit. There's Always Room In The Budget For Charitable Giving. We'll Help You Find It. Restaurant owners know that respecting employee differences and sexual and gender identities is essential to building a healthy workplace culture, but for many, that is easier said than done. Diesel is known in the Greater Boston community for their welcoming attitude toward queer communities; their space is regularly used for meet-ups to address LGBTQIA+ and trans rights issues. That is due in part to their non-discriminatory hiring methods and enthusiastic support of their LGBTQIA+ staff members who are encouraged to dress however they like while working. This open, respectful, and relaxed approach to gender identity and sexuality likewise enables customers to feel welcomed at Diesel no matter their gender or sexual identity. Once a year, the Diesel team hosts an annual Prom where staff members can come with whomever they like, dress however they feel most comfortable, and anyone can be named a queen or king. This event not only boosts employee morale and gives management an opportunity to honor and appreciate their staff, but it also reinforces Diesel's unwavering support of their staff members slinging drinks, whose vibrant personalities are only outdone by their vibrant hair color and tattoo choices. Adorning the walls behind the wooden bar stools, red leather booths, and pool tables, that make up Diesel's eclectic floor-plan are a rotating series of paintings on sale from local artists who are often regulars at Diesel Cafe. Local artists will ask to display their work for sale at Diesel, a practice that not only helps the artist sell their work but also livens up the restaurant's atmosphere on a regular basis with fresh, colorful, beautiful artwork at no additional. Repeat customers likewise enjoy being greeted with new artwork every time they visit; it shakes their dining experience up a little bit, and gives them something to look forward to experiencing the next time they pop in. Beginning in August 2018, Diesel kicked off a collaboration with a unique Massachusetts-based non-profit called More Than Words, an organization that that empowers at-risk youth and young adults to utilize business as a means of personal empowerment by managing MTW's online, retail, pop-up and wholesale bookselling businesses for 20 hours a week. Together, they created a space within Diesel's four walls for a mini-bookstore – operated and managed by More Than Words – so that customers can purchase with purpose while enjoying their morning coffee. 100% of the proceeds made from the sale of books within the mini-bookstore directly support More Than Words. Used or new books can be donated to More Than Words at any time and are sold at $4 each. Diesel Cafe’s pop-up bookstore is a part of MTW’s annual goal to bringing 50,000 books to shelves. This initiative is aimed at increasing the literacy rate amongst adults and children in the Boston area, as well as helping MTW's team members grow their business acumen and overall skillset. The Diesel Cafe X More Than Words partnership is a great example of how a restaurant can support an cause near and dear to their hearts while also positively impacting their guests' dining experience. If your restaurant is interested in piloting a similar initiative with a local non-profit, check out Idealist or VolunteerMatch.com to find organizations in your area that cater to the cause you have in mind. Don't have one in mind, but still want to give back? Send out a survey to your staff members via your employee scheduling software and to customers via your restaurant's CRM system to learn about what causes matter most to them. Choose a few organizations or causes from the responses and donate a portion of your restaurant's profits to one cause per month. This strategy allows your restaurant to support a wide array of community initiatives and causes and to show your customers and staff that what matters to them matters to you as well. Customers love to feel a part of something bigger and associating your restaurant's brand with charitable giving and community involvement will do wonders for your customer acquisition and retention efforts. How Does Your Restaurant Give Back to The Community? When it seems like there are more and more things asking to divide us, it’s wonderful to see a small business consistently striving to better connect with their local community and to embody the values that they and their customers share. How does your restaurant give back to the community? What are some creative ways you use your space to give back? What philanthropic causes will you support in time for the holidays? Share below! Looking for the best food shows, restaurant events, and restaurant trade shows to attend in 2019? Here they are. Cross-contamination can happen in every corner of your restaurant kitchen – learn to prevent it.